The heart of Bangkok, integrating the elements of life. he water flows from the regions, connecting inland canals, servicing Social and Commercial attributes, not to mention the charm and beauty of evening life. The history of the Chao Phraya is infused with her city and the linking regions. The original location was chosen by early settlers because of it's fertile ground and abundant fish. Later King Taksin, after the fall of Ayutthaya to the Burmese, located his new capital here, on the Western banks today known as Thonburi. In 1782 King Rama I, decided the Eastern banks more favourable for his reign and founded modern Bangkok. He celebrated the occasion building some of the world's most characteristic temples. Later the canals it feeds became famous, earning Bangkok its 'Venice of the East' title. Named aptly by King Rama "The River of Kings " it's the lifeblood of Bangkok. Not only is the deeply enriched with history it continues to be a rich source of commercial and social fibre, around 100,000 people still use its ferries to get to each day. Slow barges bearing cargo coast upstream while the local kids frolic in the rustic brown water. Wooden shacks, worn by the elements, still lurch over the water. 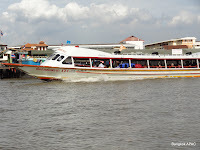 There are some Five (5) public boat lines operated by the Chao Phraya Express Boat company along the 21km route: 'local line', 'orange', 'yellow', 'blue' and 'green-yellow'. Operating between 06:00 and 19:30 daily, each is identifiable by the coloured flag hanging off its rear. The rush-hour only 'local line' stops at all 33 piers, while the other four are express lines stopping at only selected piers. Only the Orange Flag Line, with its flat fee of nominal charge, runs all day and on weekends – for most journeys this fits the bill. The others stop at around 09:00 and begin again at around 16:00. Cross-river ferries operate at most major piers and will drop you to the other bank for almost nothing, more details. 'Tourist Boats' offer unlimited trips to nine prominent piers for approx., 150 baht (hours: 09.30 - 15.00 daily). This option is very effective if you plan to visit multiple travel spots with a little more comfort and structure to your program. The other alternative for exploring the river include hiring a long-tail boat (usually includes trips through the city's canals), a river cruise or dinner cruise. All give a different perspective on this fascinating river. Phra Arthit Road runs parallel to the Chao Phraya River, from Phra Sumen fort to Thammasat Universty. Lined with vintage shop houses, cosy hole-in-the-wall restaurants, bars and cafés with live music, it's where you'll find arty followers after sundown before migration to nearby Khao San Road. 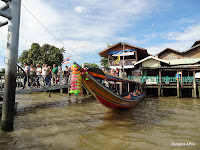 The nearest river pier is Phra Arthit Pier. Thewet is enchanting, people come to make merit by releasing fish or to feed the school of frenzied catfish scraps of bread. There's also a old and fading yet very effective local wet market, and the entrance to Royal Dusit nearby. Oriental, the old Westerner Quarter with crumbling European architecture, antiques shops and the venerable Mandarin Oriental Hotel, where some of the 20th century's most eminent scribes once stayed. The nearest river pier is Oriental. Pak Khlong Flower Market, a living breathing oriental market teeming with life and colour, is one of the most pleasant places to spend an early morning. Find fresh flowers of all species, fruits and vegetables at wholesale price. The nearest river pier is Rajinee.